ECT performed a comparison test of gas turbine cleaning products on a Frame 7F in California that is operated by a large wholesale power generation Company. The Company had been avoiding gas turbine compressor washed due to the high cost of collection and disposal of the rinse water. The plant operators were not able to achieve a high level of cleaning, the incumbent product generated too much foam and the incumbent chemistry required excessive water, nearly 10,000 gallons, to rinse. ECT used our ethoxylated amine product PowerBack as an alternative to the ethoxylated alcohol based product that was being used at the plant. ECT was able to deliver better cleaning results – as shown by a 3% compressor performance improvement. The improved cleaning was achieved using only a single rinse, which reduced the rinse effluent by 9500 gallons. 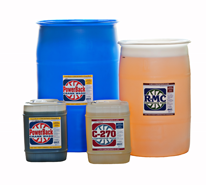 This reduction in rinsing saved the Company over $10,000.00 per cleaning in waste disposal costs. The Company has seen similar results on sister sites and started to expand the program throughout North America. Contact ECT for an evaluation of your existing gas turbine crank wash procedure to see how we can help you lower your operating costs. Amine based formula with twice the active ingredient; used for heavy duty gas turbine cleaning and crankwashing. Contains ECT’s proprietary low foam technology to improve cleaning and reduce rinse water consumption. Biodegradable, nontoxic & nonflammable, meets all OEM specifications. Copyright © 2014 Engine Cleaning Technology, Inc.